The very mention of the Victorian workhouse conjures up dark visions of Britain’s Dickensian past – ragged children, and the hollowed out faces of the desperate poor who were forced to throw themselves on the mercy of the parish. The ‘charity’ they received was calculated to do little more than keep them alive, and to ensure they were fittingly grateful to their betters. 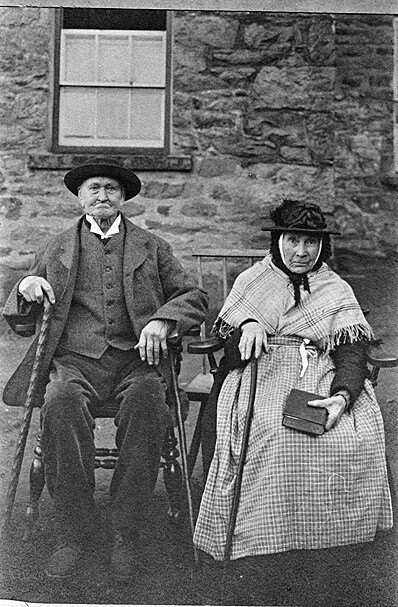 A couple pose for a rare workhouse picture – not a happy place! This was none the less so in Bala, in the foothills of Snowdonia, where to this day visitors to the town gaze through the iron gates on Plasey Street at the imposing slate-grey stonework of the old workhouse. Some think it looks like a castle, others a prison, and imagine what life must have been like for its inhabitants when it was built 180 years ago. But to me it is now home. Established as a workhouse in 1837 – the year Victoria came to the throne – it housed 80 unfortunate men, women and children from the estimated 1,030 paupers in the town and surrounding districts. In all probability, it wasn’t a happy place, but few records exist and I haven’t been able to find any written accounts of life there. Life certainly wasn’t made easy for inmates who were forced onto the charity of the parish – food was minimal and the work provided dull and repetitive. The running of workhouses was determined by the Poor Law Union – a national set of rules and regulations established in 1834 and run locally by a board of guardians. They even dictated what was fed to inmates, though the quality varied – usually from poor to dreadful. Milk could be watered down, with chalk or flour added to restore its bulk, and the flour itself was often adulterated. A typical week would see meat served twice a week with potatoes, bread, porridge and gruel as staples. There was little variation – even on Christmas Day. The general rule was that food in the workhouse should be no better than that available to the poorest who still scraped an existence outside its gates. Amazingly, it wasn’t until 1929 that the workhouse system was finally abolished. By then, the Bala workhouse had gone through many major changes. Always unpopular with locals, it proved to be too near the centre of town for their liking – poverty was a dirty secret in Victorian times best kept hidden from the casual glances of the more fortunate. In 1875 plans were drawn up for a new, larger, workhouse to the west of the town – built for the magnificent sum of £2,250. The new workhouse was later demolished, but part of the stonework is still to be seen in the medical centre that now stands on the site. The old building remained standing and went on to serve as the County Militia barracks, and subsequently as an oatcake and biscuit factory, water bottling plant and as a pajama factory. Aykroyd and Sons were the last commercial tenants, until they moved to a modern building on the edge of town. The main building then lay derelict for 17 years until we became the new owners of the central section. Other owners have since bought the two remaining units, and all are in various stages of renovation. The workhouse was recognized as an important historic building in 1951, when it was given a Grade 11* listing. Only 5.5 per cent of listed building in the UK enjoy this elevated status, but it didn’t prevent the building falling into disrepair once Aykroyd’s left. Outbuildings fronting Plasey Street were converted into small holiday cottages, and three new cottages were built in the grounds, but the rest of the building was left to the mercy of the elements, the only residents the local jackdaw population and the odd stray cat. Luckily, Aykroyds had split the building into separate parcels, and offered them for sale with the benefit of planning permission in the hope that they would become habitable again. Slowly, the individual units have been sold and my partner Georgina and I jumped in after falling for the old building’s gothic charm – jackdaws and all. Timbers on the roof were rotten, tiles missing and water leaked in. Dry rot and wet rot infested the walls, some of the floors had started to collapse and the old cast-iron windows were falling apart. There was no water, electricity or drains. Apart from that it was OK! At the time of writing, work is underway on our part of the building and one of the unit’s next door. Three cottages that front Bala High Street are also being renovated, and slowly the historic old property is coming back to life. Over the course of the coming months I will be posting little snippets about the workhouse and its past, so feel free to join in with your own recollections or opinions. *I would recommend anyone who wants to read further about workhouse life to seek out the books of Peter Higginbotham, whose Workhouse Encyclopedia is a revelation.